Chances are you have a least one person on your list that you’re going to buy a gift card for this holiday season. I compiled a list of all the gift card promotions happening for both local Boston restaurants and national chains that are located in Massachusetts. Make sure you read the terms and dates (link in the title) of each promotion as each restaurant varies. But if you are going to buy a gift card anyway, might as well get a little something for yourself too! The Aquitaine Group: Receive a complimentary $20 dining certificate valid after 1/1/13 for every $100 you spend on Aquitaine Group Gift Cards. The Aquitaine Group includes Aquitaine, Gaslight Brasserie, Metropolis Cafe, Union Bar and Grille, Cinquecento Trattoria, and Greenlight Cafe. Buffalo Wild Wings: Buy $25+ in Gift Cards before 12/31/12 and get a blazin’ bonus that could be worth $5-$100 at Buffalo Wild Wings! The Capital Grille: Buy $500 worth in Gift Cards and receive a free 4-piece steak knife gift plus bonus cards. Cheesecake Factory: For every $25 purchased in Gift Cards now until 12/26/12, receive a free slice of cheesecake redeemable 12/16/12-3/31/13. Chili’s: Now through 12/26/12, save 10% when you purchase $100 or more in Gift Cards. Chipotle: Buy $30+ in Gift Cards at Chipotle before 12/31/12 then bring your receipt at your next visit for a free burrito, bowl or order of tacos. CBS Scene at Patriots Place: Buy $100 in gift cards through 12/24/12 and receive a free $20 gift card! Denny’s: Buy $25+ in Gift Cards, and receive a free $5 bonus card on orders of $10 or more, for a limited time. 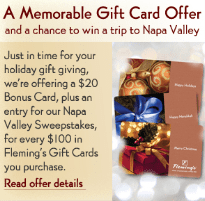 Fleming’s Prime Steakhouse & Wine Bar: For every $100 in Gift Cards purchased before 12/31/12, receive a free $20 bonus card. Jerry Remy’s: Buy 4) $25 gift cards for Jerry Remy’s and receive a $50 bonus card, for a limited time. Margaritas Mexican Restaurant: Now through 12/31/12, buy a $50 gift card, receive a $10 bonus card, and/or buy $100 worth in gift cards, receive a $25 bonus card! 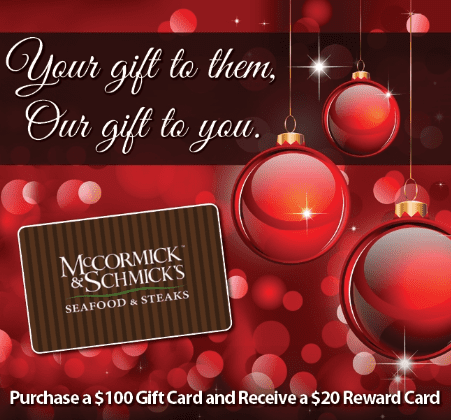 Morton’s Steakhouse: Purchase $250 in gift cards from now until 12/24/12 and receive a free $50 rewards card valid from 1/2/13 to 2/12/13! Not Your Average Joe’s: Buy $50 worth of Gift Cards through 12/31/12 and receive a free $10 appreciation card that is valid for 90 days from gift card purchase. Outback Steakhouse: Receive a free $20 bonus card (valid 1/10/13-2/10/13) when you buy $100+ in gift cards by 12/31/12. Limit of 10. P.F.Changs: Receive a $20 bonus card valid from 1/1/13-3/31/13 when you buy $100 in P.F.Chang’s gift cards. Qdoba Mexican Grill: For every $25 you load on a single Q-Cash Card by 12/31/12, you’ll get a $5 voucher to spend on a entree in January or February of 2013. Ruby Tuesday: Purchase $50 in Gift Cards through 12/31/12 and receive a $15 Bonus Coupon through e-mail valid from 1/2/13 to 2/28/13. Smokey Bones: Buy $50 in Gift Cards through 12/24/12, and receive $10 for yourself. T.G.I. Friday’s: Get a free $5 Bonus Bites Card for every $25 you spend on Gift Cards. Yardhouse: For every $50 spent through 12/31/12, receive a $10 bonus card on future purchases. And if you’re not too sure what you are looking for, head to Shaw’s to take advantage of their Gift Card promotion! From now until 12/22/12, buy $100 worth of select gift cards, and grab $10 off your next shopping trip. The participating gift cards switch each week, so look for a sign at your local Shaw’s to see what stores are participating that week! Earlier this month, I grabbed $50 to Kohls and $50 to Lowes, and grabbed a Catalina coupon to spend on my next grocery trip for free groceries! Sweet! And if you enjoyed this post, please make sure you subscribe to Boston on Budget’s RSS feed, follow us on Twitter or like us on Facebook or all of the above for wicked awesome money-saving tips and posts in the future.